And always online at our new web address: hoosierhistorylive.org! You can listen to Hoosier History Live! live on the air each Saturday, or listen online at the WICR website during the broadcast. We invite you to visit our website! We'll be a wee tardy - two days after St. Patrick's Day - with the next show in our popular series about ethnic immigration to Indiana. Regardless, please join us as Hoosier History Live! 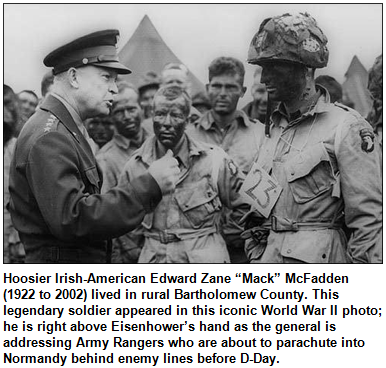 tips our hat to the Irish among us by exploring when and why immigrants from the Emerald Isle came to the Hoosier state, where they settled, and their cultural and economic impact here. 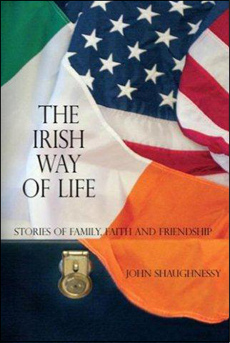 Nelson is delighted that he'll be joined in studio by his longtime colleague John Shaughnessy, former columnist for The Indianapolis Star and author of The Irish Way of Life (Corby Publishing), an anthology of human-interest stories about Irish immigrants; John currently is assistant editor of The Criterion, the newspaper of the Catholic Archdiocese of Indianapolis. Agents for the Wabash and Erie Canal in the early 1830s specifically recruited Irish immigrants to Indiana with advertisements for "canal hands" offering "$10 per month for sober and industrious men," according to David's account. Others came to build roads, including the Old National Road. According to Peopling Indiana: The Ethnic Experience (Indiana Historical Society Press), in 1900 six of the 10 Hoosier counties with the highest numbers of Irish immigrants were on the old Wabash and Erie Canal line or on the Old National Road: Allen, Cass, Marion, Tippecanoe, Vigo and Wayne counties. Life here certainly wasn't a breeze for many of the immigrants. Although canal excavation offered a way to escape urban poverty in East Coast cities, it was hard, dirty and (in the summer) hot work, Peopling Indiana emphasizes. Canal diggers lived in "primitive and unsanitary shelters" and "moved in social circles that were conducive to rowdiness and heavy drinking." Conditions became so deplorable that Irish-American newspapers even started discouraging immigrants from taking jobs in canal construction. Other challenges mounted. Funding for public works projects such as roads and canals often dried up, meaning the Irish found themselves unemployed "within a community unable to absorb them financially," according to an account by David Vanderstel, our guest. 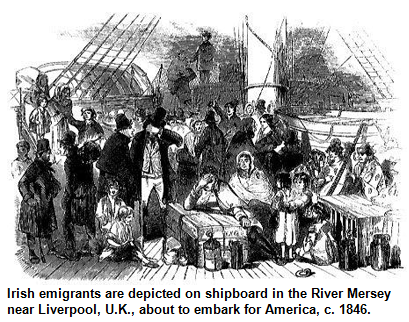 In Ireland, the potato famine that began in the 1840s resulted in a tidal wave of immigration. According to The Irish in America (Hyperion), one-fourth of the country's population had come to America by 1860. Conditions on the boats to America have been described as wretched; so many Irish died during the voyages that the boats became known, as The Irish in America puts it, as "coffin ships." Is it any wonder the Irish often have turned to music as a diversion? John Shaughnessy's book includes insights about Irish folk tunes and the ways that love and loss frequently are intertwined. He also conveys a sense of the awe with which generations of Irish families have regarded the University of Norte Dame. Although Notre Dame was founded by a French priest, it quickly became an Irish Catholic bastion, with its sports teams known, of course, as the Fighting Irish. During the 1850s, the Irish immigrant population tripled in Indianapolis and Terre Haute. In Indianapolis, the early waves of Irish immigrants tended to settle in two neighborhoods: the area that became known as "Irish Hill" on the near-Southside (it's generally considered to be bounded by Shelby Street and College Avenue) and Fountain Square on the near Southeastside. So there is much Hoosier turf, or sod, for John, David and Nelson to explore. Rest assured, the show won't just consist of facts and trends. John, whose grandparents were Irish immigrants, will share anecdotes that convey, as he puts it, "the heart, humor and heritage" of the Irish among us. Along with his siblings and cousins, John has made certain his grandparents' names have been etched at Ellis Island on the American Immigrant Wall of Honor. Chris Gahl of the ICVA tells us to head to Vernon in southeastern Indiana on April 16-17 for the Sassafras Tea Festival, sponsored by the Jennings County Historical Society. You'll be able to see a Civil War reenactment of Morgan's Raiders passing through Vernon, which occurred in July of 1863. During that confrontation, Confederate General John Morgan demanded the surrender of the town and was met with resistance from Colonel Hugh Williams of the Indiana Legion, who said that Morgan "must take it by hard fighting." No real battle occurred, and Morgan's men headed south to Dupont in Jefferson County. By the way, Jessamyn West's book The Friendly Persuasion was based on this historic incident and other stories told to her from her early Quaker childhood in Jennings County. Also, Conner Prairie's reenactment of Morgan's raid at Dupont will open on June 4 this summer. 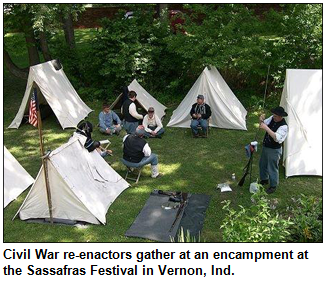 If you travel to the Sassafras Tea Festival in Vernon in April, you'll also be able to visit a Civil War encampment, waltz at the Blue-Gray Ball and chow down on ham and beans, homemade pies and sweet breads - and also some sassafras tea. Irish immigrants founded the oldest Catholic church in Indianapolis. Origins of the parish date to the 1830s. However, the current church building, the third for the parish, was constructed during the late 1860s and early 1870s. The parish rectory was built during the Civil War, then significantly enlarged. 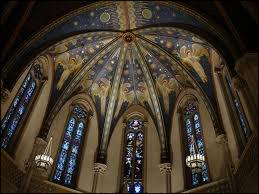 Question: Name the historic Catholic church founded by Irish immigrants to Indianapolis. Hint: It was the focus of a Hoosier History Live! show last fall. To win the prize, you must call in with the correct answer during the live show. The call-in number is (317) 788-3314, and please do not call until you hear Nelson pose the question on the air. Please do not call if you have won a prize from any WICR show during the last two months. The prize is a pair of tickets to the Indianapolis Motor Speedway Hall of Fame Museum, courtesy of the ICVA. Please tell our sponsors that you appreciate their support: Avant Garb, Indiana Historical Society, Lucas Oil and Story Inn. Our own Nelson Price, an expert on all things Hoosier, grew up in Indianapolis during the 1960s, a decade that began as a mild reflection of the complacent '50s. That decade later turned itself upside down with its social upheaval, spotlight on racial and social injustice, and opposition to the Vietnam War. Was Indianapolis still in a time warp during this period? If you watch public television's new documentary Indy in the '60s, you will see Nelson weigh in various topics, including downtown Indy at the time. He also talks about local television personalities, the House of Blue Lights, the Coliseum explosion in October of 1963, and his family's reaction to the JFK assassination, which occurred less than a month after the explosion. Incidentally, visit the homepage of our website to view a list of shows created over the past three years, many of which cover these topics in radio interview format. When the spotlight shines on Victorian-era women during Women's History Month, they typically are depicted as repressed, prim and obsessed with "proper" social behavior. The most famous Hoosier suffragette, educator and civic leader May Wright Sewall, caused a stir in the late 1800s by insisting that her Indianapolis Classical School for Girls include a gymnasium. (Physical education was not considered "proper" for girls.) Mrs. Sewall also wore her skirts at ankle length, a shocker in an era when women's dresses swept the ground. Indeed, says Karen Lystra, there was a fixation during the Victorian era (1837-1901) with displaying "proper" behavior in public. In private, though, the Victorians were anything but prudish, enjoyed a bawdy sense of humor and have been inaccurately stereotyped for generations, Karen says. Rather than succumbing to loveless marriages as per stereotypes, Victorian-era people pioneered the concept of love as a basis for marriage, breaking from previous generations who placed sharp restrictions on who could wed whom, Karen says. "Victorians didn't invent love, of course, but they were revolutionary in the concept of love as a basis for marriage," she notes. "This also sets up divorce, because when you base marriage on feelings, you set up expectations." Karen, the author of Searching the Heart: Women, Men and Romantic Love in Nineteenth Century America (Oxford University Press), is tracking down letters written by working-class Hoosiers during the Victorian era; she welcomes tips and may be contacted at klystra@fullerton.edu. Meanwhile, Karen has been giving fascinating presentations around Indy - including to the Hoosier Chapter, Victorian Society of America - as she explains who created the myths about our Victorian ancestors and why they differed so much in private from their "proper" public personas.